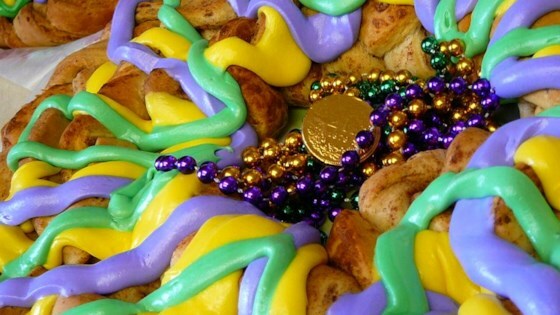 "Do you love the way a King Cake brightens up your party but hate the time it takes to bake one? Here's an easy recipe that's fast and fun and easier than pie! A small plastic baby inserted into the side of the cake will bring good luck in the coming year to whoever discovers it in their slice of cake. Beads, additional plastic babies, curly ribbon, and other festive trinkets can be used to decorate the cake." Open the cans of sweet roll dough and unroll the dough from each can into 3 strands. Working on a clean surface, place 3 dough strands side by side and gather them together to make one large strand. Fold this in half, and roll slightly to make a fat log. Repeat steps with the remaining dough. Place each log on the prepared baking sheet and shape to make a ring, overlapping the ends and pinching them together to make a complete circle. Pat the dough into shape as necessary to make the ring even in size all the way around. Cover loosely with foil. Bake in preheated oven until firm to the touch and golden brown, 50 to 60 minutes. Check often for doneness so the ring doesn't overbake. Place on a wire rack and cool completely. Place the cake ring on a serving plate. Cut a slit along the inside of the ring and insert a small plastic baby, pushing it far enough into the cake to be hidden from view. Divide the frosting evenly between 4 bowls. Stir 1 tablespoon of milk into each bowl to thin the frosting. Use the frosting in one bowl to drizzle over the cooled cake. To the remaining three bowls of frosting, stir yellow food coloring into one and green into another. Stir the red and blue food colorings together with the frosting in a third bowl to make purple frosting. Drizzle the cake with yellow, green, and purple frostings in any desired pattern. Dust the cake with multi-colored sprinkles and decorate with beads, additional plastic babies, curly ribbon, and other festive trinkets. Make the famous New Orleans cake with the surprise inside! Always tell everyone before they eat the King Cake that there is a hidden plastic baby somewhere in the cake, so no one will choke on the baby! I'm just wondering what the correct dough is? Is there a name brand you can recommend? I plan on making this later this week and I want it to come out right :-) Thanks! Cool. I am from Baton Rouge,La and this is just as good as the best King cake i have ever had. But the traditional colors are purple, yellow and green.